For Scotch whisky aficionados, Cadenhead's Whisky Shops in London and Edinburgh has always been more than an iconic whisky shop or a famed specialist bottler of rare whiskies. The company boasts an impressive list of firsts that have been historic milestones in the evolution of the Scotch whisky industry. 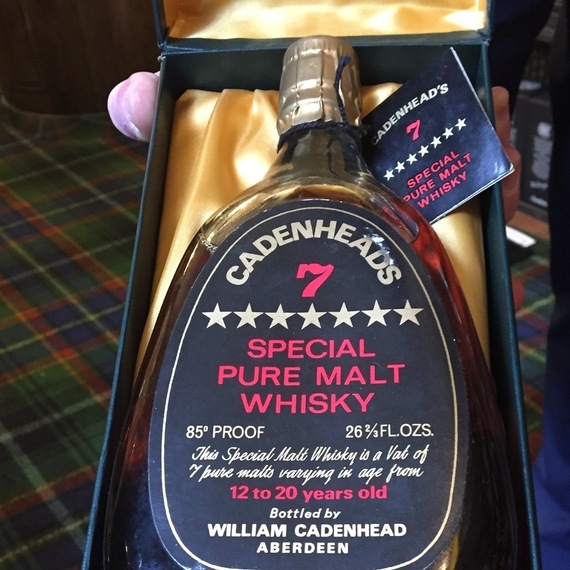 Indeed, it would be fair to say that Cadenhead's is as much a whisky shop and specialty bottler as it is a shrine to the history and evolution of Scotch whisky over the last two centuries. The original company was established by William Cadenhead in 1842. At the time, the Excise Tax of 1823, which had largely legalized the Scotch distilling industry, was less than 20 years old and the modern Scotch whisky industry was still in its infancy. The company was created by the amalgamation of two separate companies. It consisted of a rum merchant owned by Robert Cadenhead with offices in London and Liverpool and a spirit merchant specializing in whiskies based in Aberdeen owned by William Cadenhead. The exact relationship between William and Robert is unclear, although they appear to have been related in some way. The amalgamation of the two companies was prompted by Robert's death. At the time rum was a far more commercially viable product. The rum industry in Great Britain has been in existence for almost two centuries and was already well established. The daily rum allotment already had a long-standing tradition in the Royal Navy and was also widely followed in Britain's merchant fleet. Scotch whisky had been growing in popularity following the visit of King George IV to Edinburgh in 1822, and his enthusiastic endorsement for whisky from the region of Glenlivet in the Highlands. William Cadenhead was an enthusiastic promoter of Scotch whisky and was the first to commercially bottle single malt whisky for sale to the public. At the time distillers did not bottle whisky or sell directly to consumers. Individuals could buy a barrel of whisky from a distillery for their own use and either consume it directly from the barrel or they could have it bottled by a bottling plant. Most whisky was sold by distillers to grocery shops where in turn it was usually blended or "vatted" with whisky from other distillers. At the time it was illegal to blend malt whisky with grain whisky. So the blends being offered by the grocers would have been a blend of various single malts from different distillers. The blending of grain whisky with single malts to create blended Scotch whisky did not occur until after the passage of Gladstone's Spirits Act in 1860. A Cadenenhead's vatted malt from the 1930's at the London store. Initially whisky would be sold directly from the cask and starting in the 1840s, it would also be bottled by the grocers for sale to their customers. Officially the first "branded," vatted malt whisky sold in a bottle was produced by Andrew Usher in 1853. Usher's Old Vatted Glenlivet was a blend of Speyside malts. It's likely, however, that grocers throughout Scotland were already selling their own unbranded, bottled, vatted whiskies. This is also how an obscure grocer in Kilmarnock named Johnnie Walker first got into the Scotch whisky business and went on to create an iconic brand that has become the world's best-selling blended Scotch whisky. William Cadenhead believed that Scotch whisky from a single distillery bottled directly from the cask was far better than a blend of single malts. Cadenhead was in fact bottling single malts more than a century before the practice caught on in the rest of the industry. He was also the first to offer single cask bottlings, and by extension single cask strength bottlings, making him the very first specialty Scotch whisky bottler. At the time all whisky was bottled at cask strength. The practice of diluting Scotch whisky to a lower proof did not occur until 1915, in an effort to reduce drunkenness among industrial workers during World War I. Initially, the alcohol by volume (ABV) strength had been set at a maximum of 37% but it was later raised to 40% ABV in 1917, where it has remained to this day. In its early days, the bulk of the Scotch whisky sold by Cadenhead would have been single malts from single cask bottlings. The company, however, also produced and sold various vatted scotches that Cadenhead had blended. Despite the widespread incorporation of grain whisky into blends starting after 1860, Cadenhead's stayed true to its single and vatted malt roots for the first 50 odd years of its existence. It was only in the early 20th century that the company began to bottle its own proprietary blended whiskies from a combination of single malts and grain whisky. For the first three quarters of the 20th century, the company remained an independent specialty bottler of Scotch whisky. 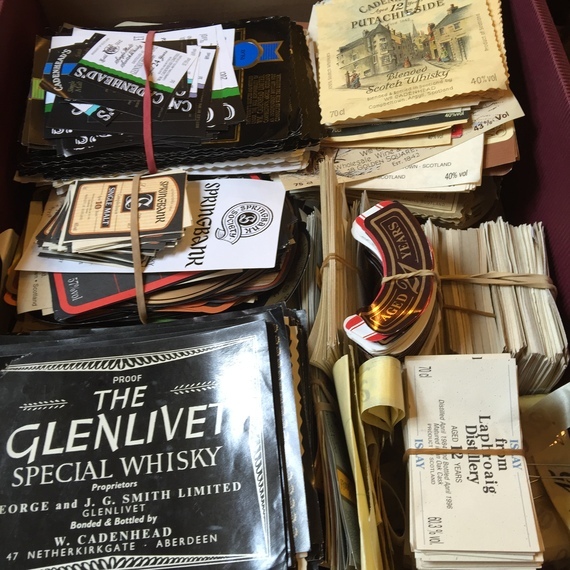 Its range of whiskies was sold by commercial whisky shops around the world, but the bulk of its sales came from the UK and a few key commonwealth markets. The first Cadenhead's Whisky store didn't open until 1971, In Edinburgh. The London store didn't open until 1995. At the time it opened in London, Cadenhead's was the city's first specialty whisky shop. It's hard to believe that the London store has only been in existence for just over 20 years, as it has rapidly become a global icon for the world's Scotch whisky enthusiasts. About the time that Cadenhead's was expanding into retail stores, it accepted an offer to merge with independent Scotch whisky producer J & A Mitchell. Cadenhead had a long-standing relationship with the Mitchells, having bottled specialty offerings of their Springbank distillery for many years. The union of two historic independent Scotch whisky companies would usher in a period of rapid growth at Cadenhead that would further transform it into a Scotch whisky institution. The company now has 8 retail locations across Europe - 3 in the UK (London, Edinburgh and Campbeltown), 2 in Germany (Berlin and Cologne), and one each in Denmark, Austria and Switzerland. The stores are locally owned in what Cadenhead's management describes as a sort of franchise arrangement, and carry a broad assortment of both Cadenhead's bottlings, as well as other spirits from around the world. Currently the company has no plans to open retail locations in North America, relying instead on its American and Canadian importers to distribute their small batch whisky line. 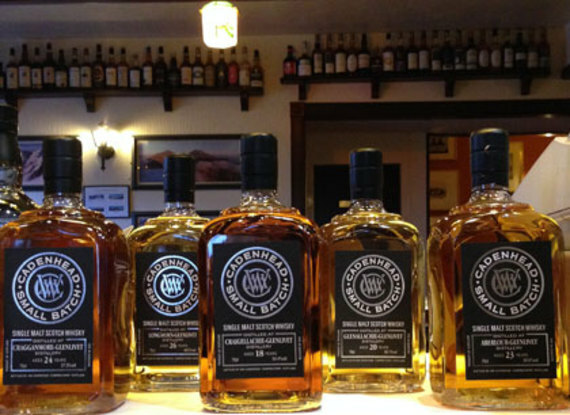 Currently, Cadenhead bottles five distinct ranges of whisky. The Authentic Collection consists of single cask bottlings of particularly rare whiskies. Only a few hundred bottles are produced and these are only available at Cadenhead stores. The typical store only receives an allotment of six to 18 bottles, depending on their size. They typically sell out on release. Indeed, so strong is the current demand for specialty bottlings of rare and unique Scotch whiskies, that even the London store has virtually nothing available that is more than 18 months from their bottling date. Over 80 percent of the store's offerings were bottled in the last 12 months. The company's most popular Authentic Collection bottlings currently are Springbank (all ranges), Longrow and the now discontinued Hazelburn 12 YO sherry cask offering. Vintage Islays, when they can be found, typically sell out in "seconds." The 1842 Casks are quarter casks that are maintained in the three British stores. Bottles are filled on demand and dated to the exact day they were bottled. Quarter casks were the traditional way of storing Scotch whisky until the passage of the Distillers Act largely legalized the industry. Quarter casks could be handled by one or two men and were small enough to transport by pack animal over mountain trails, an important feature when trying to avoid the tax collector. It was only with the legalization of distillation that the industry adopted larger sized barrels. The 1842 Quarter Cask offerings in the London store. The in-store cask program, dubbed the 1842 casks to commemorate both the founding of the company and in reflection of how Scotch was sold in its early days, began with offerings from the Highlands and Islay in 1999. The first bottlings occurred with the new millennium. Originally the cask program was called the No. 3 Bond after the old bonded warehouse in Campbeltown. The program has since expanded to include an offering from the Lowlands and Campbeltown. There is also a cask offering of dark rum. Each cask is a blend of single malts from the specified region. The highland cask is a mix of both Highland and Speyside malts since, technically, Speyside is part of the Highlands. The casks are refilled when they reach the halfway point, creating a quasi-Solera effect. The Islay, Campbeltown and rum casks are usually refilled every two weeks, while the other casks usually take four to six weeks to reach the half-way point. Each refill is based on a unique blend, based on the single malts currently available. The contents of each cask can vary quite dramatically from month-to-month. Given how quickly the cask's contents turnover, each bottling is in fact a unique expression of that particular region's whiskies. The London store's 1842 cask program is ending however. The Scotch Whisky Act (SWA) of 2009 forbade the maturation of single malts outside of Scotland. A whisky in contact with wood is technically still maturing and its presence outside of Scotland is a violation of SWA regulations. The two other stores in Edinburgh and Campbeltown don't have this issue, as they are both in Scotland. Going forward, the London store will offer the 1842 Cask program already botttled. 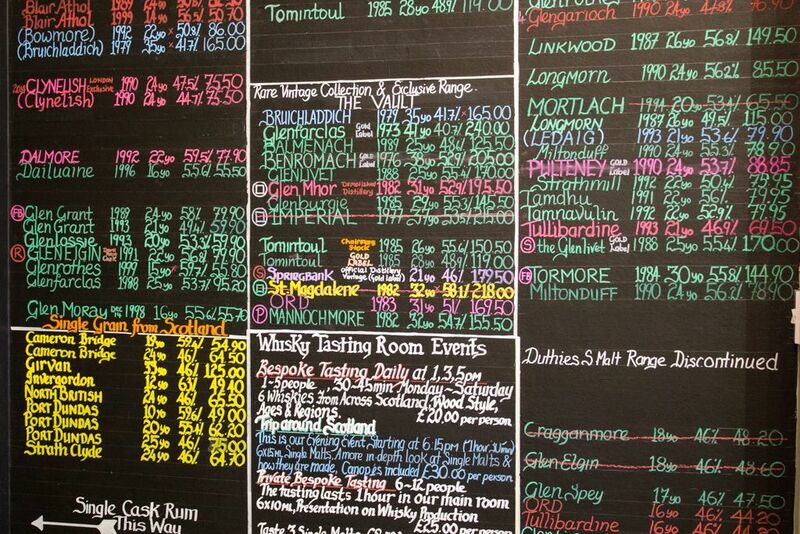 If you want the genuine 1842 cask experience, however, you wiill have to travel to one of the two Scottish stores. The company also bottles two small batch lines of Scotch whiskies. The Small Batch Black Label typically involves one to three casks on average, while the Small Batch Gold Label are single cask bottlings. Both lines feature unique bottlings, although not as rare as the Authentic Collection, and both are in very high demand. Among the recent offerings were an Auchentoshan 1992, 23 YO, 46.6% ABV, 70 cl, a Benriach 1986, 29 YO, 50.1% ABV, 70 cl and Cameronbridge 1989, 26 YO, 56.6% ABV, 70 cl, single grain. Cadenhead's Small Batch Black Label range. Cadenhead has also announced a new line called the William Cadenhead Range. These bottlings do not indicate the distillery where the whisky was produced. Presently, the range includes a single cask Irish whiskey, a single cask Islay whisky and a Solera 12-year-old sherry cask blend. The latter is a unique offering. Cadenhead purchased several hundred casks of sherry wood matured single malts and grain whiskies and blended them together in a 12-year-old blend. Whisky is drawn from the casks for bottling and the casks are then topped up with new 12-year-old whisky. The result is that the youngest whisky is always at least 12 years old and the oldest whisky will continue to age in a unique Solera-like combination of different aged whiskies. The firm's most prestigious line is The Vault, a selection of ultra-rare whiskies that have been sourced from Cadenhead's and Springbank's own warehouses, as well as other whisky distilleries. The bottlings in The Vault range rarely make it to the store's shelves as they are typically sold out on release. Among the recent offerings in The Vault range have been a Glenfarclas, 1973 42 YO, 40.2% ABV, 70 cl and a MacPhail 50 YO, Rare Vintage, 40% ABV, 70 cl. A chalk board with Cadenhead's current offerings. Many bottlings sell out on release. As Cadenhead closes in on the start of its third century it continues to be a trailblazer in the Scotch whisky industry; adding to its impressive lists of industry firsts. 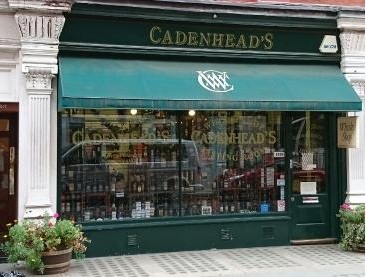 For the Scotch whisky enthusiast on a visit to London or Edinburgh, a visit to a Cadenhead store is not to be missed. Be forewarned, however, that you can spend hours discussing the finer points of a Scotch whisky with their knowledgeable and hospitable staff. Their weekly tastings, as well as their innovative food and whisky pairings, are legendary and are not to be missed. The tastings are in high demand, however, and a reservation well in advance of a visit is recommended. 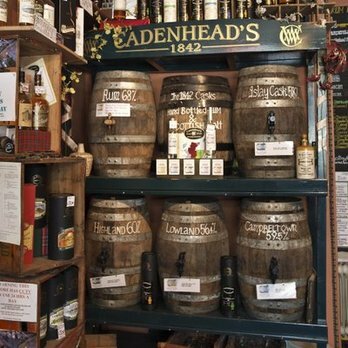 Cadenhead's whisky shop - it's not just a whisky store it's a shrine to Scotch whisky and a living legacy of the Scotch industry's history.